Metallica has announced that they will release a live DVD titled Quebec Magnetic on December 10, 2012. The DVD captures the two World Magnetic live shows which took place in Quebec City in the fall of 2009. The setlist (see below) for the DVD was voted on by the over 35,000 of the band's fans at Metallica.com this past September. Meanwhile, guitarist Kirk Hammett told Loudwire that the band will be getting together "in the next couple of months" to begin work on a new Metallica album. "We're going to meet up and start throwing ideas together," says Hammett. "I'm really looking forward to that. What's not going to be so fun is going through all the musical ideas that we have. I'm not really good at editing myself because I think it's all good." Earlier this summer, drummer Lars Ulrich told Vancouver radio station The Fox 99.3 that a new Metallica album could be out in late 2013 or early 2014: "I would say late '13 or early '14. It's difficult to imagine. I think even late '13 may be a bit optimistic. I would say hopefully we can realistically get a record out probably about a year and half from now, so maybe early '14." John McLaughlin Still Mounts a Serious Flame on "Now Here This"
He may be 70 years old, and it may be his 24th solo album, but on his latest release, Now Here This, guitarist John McLaughlin plays with all the fire, veracity, and adventure of, well, the John McLaughlin of 40 years ago. The cleverly Zen-titled disc comprises eight new McLaughlin compositions executed to the highest standard by his band The 4th Dimension, which features Gary Husband (keyboards), Etienne M'Bappe (bass), and newcomer Ranjit Barot (drums). Outside Playing by Wolf Marshall - A video lesson on how to use non-scale tones and dissonance to craft attention-grabbing lines! Leadoff track "Trancefusion" proves the perfect ear-catching showcase for McLaughlin's still-formidable chops, slicing through pentatonic 4ths lines, arpeggios, and bop-flavored phrasing all in his trademark overdrive. Also does it serve as an eye-opening introduction to Barot, whose labyrinthine polyrhythms are not only mesmerizing but prove a thrilling match for McLaughlin's intensity. "Riff Raff" and "Call and Answer" bring similar fire and energy, both tracks also highlighting the funkier and aggressive side of M'Bappe's crisp bass style. That he can attack his fingerboard so ferociously one moment and then coerce a soothing fretless purr on the ballad "Wonderfall" the next speaks volumes to his mastery. The latter also showcases Husband's delectable phrasing, shifting seamlessly from fiery scalar lines to angular intervallic puzzles and back again. Given the fusion inferno that engulfs Now Here This, "Not Here Not There," is a surprisingly "smooth jazz" entry and a track that could easily be mistaken for Neal Schon "jazz" instrumental. That perplexity aside, Now Here This is an album that clearly shows why McLaughlin is widely lauded as one of the greatest guitarists of all time—and not just by journalists and fans but also by his peers. We've just posted new guitar tab for 14 Neil Young classic hits, including "Cinnamon Girl," "Cowgirl in the Sand," "Ohio," "Hey Hey, My My (Into the Black)," "Old Man," and more. Click the following link to see all available titles. These guitar tabs are from Hal Leonard's popular Play-Along series, which features note-for-note accuracy but arranged in a single guitar part—the perfect version for jamming along to the original CD or a play-along track. To see all of our Neil Young guitar sheets, click here. To purchase the Neil Young Guitar Play-Along book/CD, click here or on the cover image below. We're excited to announce that we've just posted seven new Stevie Ray Vaughan guitar jam tracks from Hal Leonard's excellent Guitar Play-Along series. The new titles include "Crossfire," "Voodoo Child (Slight Return)," "Texas Flood," "Rude Mood," "Ain't Gone 'n' Give Up on Love," "Honey Bee," and "Wall of Denial." This brings our grand total of SRV jam tracks to 18, including other classics like "Pride and Joy," "The Sky Is Crying," and "Cold Shot," among others. To get the matching guitar tabs for all 18 tracks (plus a few others), click here. Montclair, NJ (October 8, 2012) -- Hal Leonard Books, the musician's best source of books on the music business, audio technology, instrument history, and more, has published Power Tools for Pro Tools 10 ($39.99) by Glenn Lorbecki. Power Tools for Pro Tools 10 provides a detailed look inside one of Avid's most exciting Pro Tools releases yet. Instructor, certified Pro Tools trainer, and award-winning producer/engineer Glenn Lorbecki will walk you through the best ways to get the most of out of Pro Tools 10. See and experience the new features incorporated in this powerful software offering, all the way from the new ways it handles data, memory, and gain functions to some seemingly small updates that make a huge difference in your productivity. This focused and comprehensive guide provides excellent instruction in the newest Pro Tools 10 features; at the same time, it establishes a foundation of technical and creative protocol that will help beginning and intermediate users—as well as seasoned professionals—establish the most expedient work flow while recording, processing, and mixing the highest quality audio. The accompanying DVD-ROM contains video and audio examples along with sessions files that powerfully support the text. The multitrack Pro Tools session contains full rhythm section and vocal tracks, professionally recorded and skillfully explained in the text and videos. Glenn Lorbecki is an award-winning producer/engineer, musician, composer, and educator. President of Glenn Sound Studios, Lorbecki has been in the recording business since the days of punk music and has produced or recorded projects for a broad range of clients, including Weezer, Green Day, Dave Matthews, Dizzy Gillespie, Tori Amos, Nintendo, Sony, Acura, Boeing, Microsoft, and many more. He is an instructor at the University of Washington, Seattle, and is director of studies at DIGIFY Media Training. He currently serves as secretary/treasurer of the Recording Academy Board of Trustees (a.k.a. Grammys). A couple of years ago, Detroit-area jazz guitarist Jake Reichbart submitted several of his solo jazz guitar arrangements of popular tunes and jazz standards and pretty much blew us away—so much so that we asked him to put together comprehensive lessons on his arrangements of those and various other tunes, which are now available here at GuitarInstructor.com. And so it is with great pleasure that we tell you about Jake's stellar new album Is She Really Going Out With Him? The disc features 12 jazzy fingerstyle guitar instrumental covers of timeless pop songs including Joe Jackson's title track (a funky masterpiece of an arrangement), Steely Dan's "Kid Charlemagne," Chicago's "If You Leave Me Now," Tears for Fears' "Shout," and Spandau Ballet's "True." You can hear sample previews of all 12 tracks in the video below. For more info and to order the album, please visit Jake's CDBaby.com page. Also be sure to visit his official web site, JakeReichbart.com. Here's the full track listing, along with links to purchase Hal Leonard sheet music for select titles. 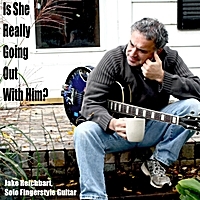 New Jake Reichbart CD demo, "Is She Really Going Out With Him?" from Jake Reichbart on Vimeo. And that's just one aspect of their brilliance. The band knows what they've achieved, and they certainly don't need validation from an organization like the Rock Hall, but they also realize that it is important to their fans—indeed probably moreso than it is to them—and it was classy of them to acknowledge that. Cheers, guys! On a related note, Deep Purple, who've been eligible (and deserving) for 20 years, was also finally nominated. Even if "Smoke on the Water" was their only achievement, compared to some of the acts already enshrined, it would be enough. Kudos to Ritchie Blackmore and the gang. Deep Purple guitar tab, video lessons, and jam tracks.